Helpful ideas no matter what grade you teach! 1. Pick up a clear plastic container to use as a cell phone "jail" if anyone pulls their phone out during class. Read more about why this works here. 2. 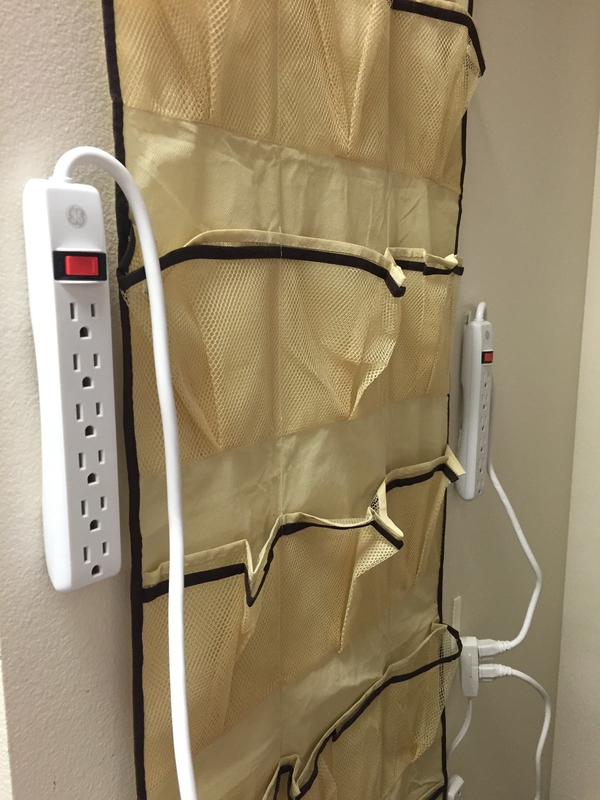 Or if you feel fancy, hang a shoe organizer on the wall with a bunch of power strips (safely connected, of course) to make a cell-phone daycare. Read more about the rules that make this work here. 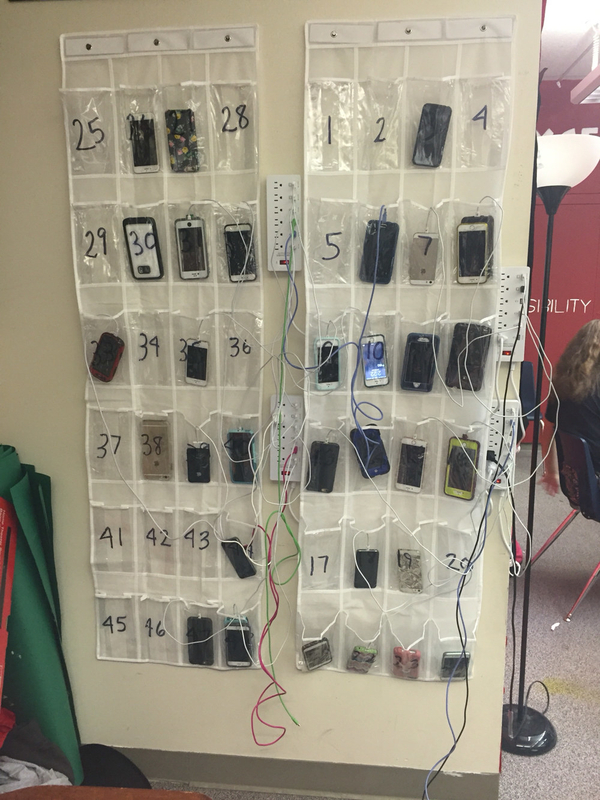 If you want all of the phones turned in at the beginning of each class, use this system of counting each student as "present" only if their phone is in their assigned pocket. 3. Cover bulletin boards in plastic tablecloths for quick and bright backgrounds. Of course, they are thin and may rip a little if students are always pinning and unpinning papers, so you could use two layers of the plastic tablecloths if you wanted. Read more about this dollar-store high school board here. 4. Then easily store bulletin board borders in dollar store soup containers. Get more classroom organizing tips and tricks here. 5. 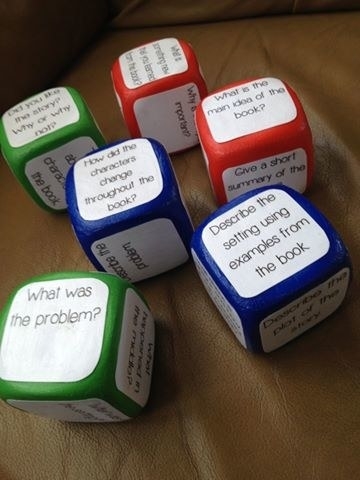 Use oversize dice and a set of wide popsicle sticks for daily journal prompts and reading questions. You can get the questions along with the full tutorial here. 6. Cut tri-fold board displays in half and reinforce with patterned duct tape to make privacy folders. Spray painting is totally optional — you could even let your class decorate the outside of their own folders. Get the full tutorial here. 7. Cut sponges in half to make cheap board erasers (and use clear sheet protectors to make cheap dry-erase boards). Wait, this is so brilliant. If you wanted to make the sheet protector stiffer, you could insert a piece of 8x10 cardboard behind the computer paper. Read more here. 8. And cut up car-wash sponges so you have somewhere comfortable to rest your wrists at your computer. If you hate the sponge look, you can cover them in fabric. Get more dollar store ideas here. 9. Use $10 worth of cookie sheets to make a stackable, easy-to-access art drying rack. If you're worried about how stable they'll be, just put some small self-adhesive rubber nubs (like the ones you'd use to keep furniture from scooting around) on the bottom of each tray where it would touch other trays. Read more about it and get more ideas here. 10. When you’re not using them to dry art projects, use baking sheets to help kids learn multi-digit addition. Learn how to print out and make this magnetic game for yourself (for free) here. 11. Then trim another cookie sheet in duct tape, and use glass gems and small magnets to make a class tracker. Not that you'd ever really lose a student, but you might appreciate this come a particularly busy day. Read more about it here. 12. Repurpose a photo album to be a reusable, traceable handwriting and alphabet practice book. This trick could also be adapted for math practice — read more about it here. 13. Make a mini greenhouse to sprout beans using a plastic cupcake container. Or whatever appropriate dollar-store container you find. Get the how-to here. 14. Make bathroom passes out of name tag pouches, key rings, and stretchy coiled bracelets. It could potentially help the passes get a little less germy, because they can easily roll up on a student's arm. Read more about them here. 15. Sort crayons by color using a popsicle mold. It's easy to see at a glance that there are the right number of crayons for each group. Read more about it here. 16. Frame a piece of computer paper to make small whiteboards. A classic, of course. This tutorial updates it to go along with a specific "daily 5" routine. 17. Sort individual math counters in plastic bags or small plastic containers so they're easy to hand out. Then of course keep each collection in plastic bins, so it's super quick to grab everything you need. Read more classroom organizing tips here. 18. Help students visualize addition and subtraction with these simple number counters. Kind of like an abacus but not. Read more about the idea here. 19. Make an absent work bin to make it simple for students who have been out to catch up on what they missed. Learn more about how it works here. Although (coming from a former student whose teachers had these), it might be helpful to remind students when they're back in class to go check the bin! 20. Sort papers for your own sanity using binder clips as changeable labels for bins and stacks of papers. At the end of the day, it's easy to use that clip to bring the stack of papers in that bin home, if you need to. 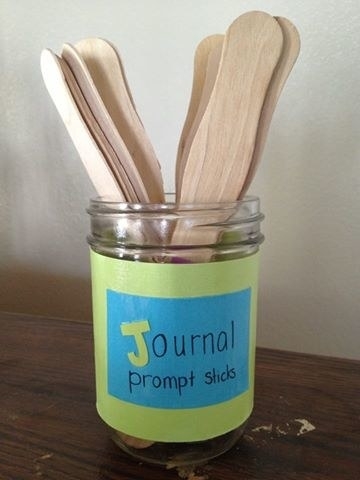 Get more classroom organizing ideas here. 21. Stack a couple of cheap crates at each group of desks to use as shelves. They're a great spot to stash supplies. From here. 22. Or pick up a few rolls of fun, colorful duct tape and use that to cover repurposed storage boxes. You could also use cheap plastic tablecloths for this, as long as you secure them well. Read more about it here. 23. Designate a bin for students to drop their library books in when they're done with them. It keeps the date in clear view and gives students a chance to turn in their books when they're done reading, before they forget. From here. 24. Write pieces of geometry proofs on craft foam, then let students work on putting the proof in order. Read more about this activity (plus an activity for an egg-hunt math worksheet) here. 25. Pick up a magnetic locker organizer to use as a dry-erase marker caddy. No more hunting for the markers on the other side of the room. Get more dollar store tips (plus some dollar store don'ts!) here.